Put Hockey out of MYEFO misery before he inflicts more damage on himself and his nation. Treasurer Joe Hockey said the Government had “made a good start”. “There is more work to be done but we are on the right track,” he said. Put Joe Hockey out of his misery, please, someone. Someone he will listen to needs to, kindly but firmly, take him aside and let him know that his government has held office over a year. Certainly, the Coalition’s grip on governing, as with its grip on many day to day realities, has been tenuous, uncertain and weakening daily but Hockey needs to be told he’s in the driver’s seat now. He needs to know. There’s a big difference between running an opposition campaign and running the country. 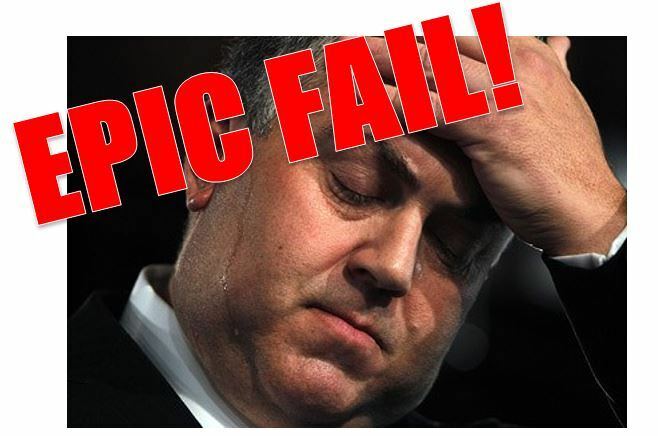 Yet, from the way Hockey’s sooking over his MYEFO today, he just doesn’t get it. Or he doesn’t want to get it – any more than he wants to face his budget’s role in helping create the $17 billion blowout in the deficit, the LNP’s own MYEFO black hole, formally announced today. MYEFO shows peak debt rising to $460 billion and the Budget balance deteriorating by $68.1 billion in just three months. This includes additional spending of $13.7 billion in just 101 days since the government was elected. Unemployment is rising to stay at 6.25 per cent from 2014-15. Break it gently to Joe, the reality of his position will clearly come as a big shock to one so under-prepared to take power; but it’s for his own sake, for everyone’s sake. And it’s only fair. It will give him a personal taste of what he has inflicted on so many other Australian workers whose Christmas surprise will be to be told by the boss they are dismissed or, in emulation of world’s best practice in HR, an email telling them their services are no longer required. Unlike Hockey, of course, there will be no prospect of a cushy job on the board of the Reserve Bank or any other bank or financial outfit he’s helped look after in office. Just growing unemployment and worsening job conditions and real wages. And amidst rising utilities costs, more than a hint of a GST hike to look forward to. Hockey can’t seem to look forward but he does need to stop deluding himself he’s still back in his larrikin glory days when he gave them heaps every day in parliament. He saw it all differently then, of course. Not for Hockey were there any extenuating circumstance, or headwinds, no such thing as a drop in receipts. He was merciless, excoriating towards the then Treasurer, World’s best finance Minister for 2011, the impressively successful Wayne Swan whose policies helped Australia weather the GFC. How Hockey jeered and heckled then. How he preened and crowed. Now it has all come back to haunt him. Hockey faces some of the very same challenges Swan had to deal with. Yet he’s hoping we have forgotten how badly he behaved then. He hopes that we will be generous and forgiving today where he was remorselessly critical, unfair and cruel only yesterday. The hypocrisy is breath-taking. He needs to wake up to himself before it is all over. It’s time Hockey stopped obsessing over Labor’s Bolshevik conspiracy, the Black Hand of Trade Unionism and other paranoid fantasies; it is time he faced the real enemy, his own government’s fiscal ineptitude under his leadership as Federal Treasurer. Put the bluff and bluster aside, Mr Hockey, the truth is that you don’t know what you are doing: your government has no coherent economic plan. Bullet points and slogans may have worked in opposition but their usefulness has long expired. Knee-jerk reflexes to cut spending such as sacking seven percent of the public service workforce and making whopping cuts to health and education will only compound the problem by depressing economic activity and lowering confidence. You bang on about small business being the backbone of the country but in cutting public service positions you effectively destroy small business’ custom. Let’s be clear about cause and effect here. It is true that we face challenging external factors in world commodity prices which are beyond anyone’s control such as the drop in the price of iron ore or the drop in oil and natural gas but Hockey’s got a lot to directly account for himself. Consumer and business confidence continue to fall while unemployment rises. Money is cheap but no-one thinks it’s a good time to borrow. ‘Ordinary Australians’ are unhappy with the Abbott government’s dismal performances. They worry about their job security, whether they can pay their bills, or is they can afford to buy a home. They expect their government to do something to help them, not make things worse. They expect the Federal Treasurer to know what to do, not come running to them with apologies, lame excuses and more hollow promises. Contrition doesn’t cut it, Joe, the electorate wants effective action informed by understanding and insight; not a series of desperate experiments but an intelligent, practical plan. Australians look to you for real leadership. Yet all you have to offer in return, it seems, is finger-wagging, fibbing and evasion. You need to take a long hard look at yourself. Perhaps you may then wake up to what you look like to others, others who are heartily sick of your errors, your evasions and your lies. What do the Australian people see when they look at you, Mr Hockey? They see a treasurer who doesn’t care, an unfair treasurer, a treasurer who makes excuses, a treasurer who can’t keep his promises, a treasurer overwhelmed by his portfolio. No good taking credit for the infrastructure Labor promised, Mr Hockey, your government won votes by promising to build infrastructure but so far it’s done nothing, a nothing which is worse than nothing given the state of the rest of the economy. Finance is unlikely to ever be much cheaper, the economy needs the boost of public spending yet all you can do is bite your nails and whinge about being blocked by the Senate. Oh, and dishonestly claim credit for projects started under Labor. Mr Hockey you are not still in Opposition: blaming others for your own mess was never a good idea and right now it can only simply further damage the Australian economy and shred the few remaining threads left of your own reputation. $17 billion in the hole in such a short time is an indictment but passing the buck here is a fatal error to you, your government, and Australia’s economy. You are in the driving seat, Mr Hockey, despite your evasion and your denial. It’s an alarming, prospect, we grant you but it has to be faced. Those at the Abbott government wheel appear to be facing backwards, looking to the past for direction, suckered by trickle-down and other rightist myths of economic management, itching to cut and shuttle back the engine of recovery. The ‘adults in charge’ Abbott government bickers and blames Labor; blames the drop in international commodity prices; blames any independent press and still tries to take its hard dry right hands off the wheel while its ‘open for business’ juggernaut veers alarmingly out of control and all over the road. Skittling sundry unwary advisers, former employees, contractors and the odd supporter it accelerates madly downhill towards its inevitable fatal collision with destiny. Mr Hockey, who until recently drove like Mr Toad of Toad Hall, now in MYEFO dock adopts a different guise, a different plea: he wants to beg the nation’s mercy, admit he got things wrong. It’s not what the electorate wants to hear. Mr Hockey. It is not good enough. It would be better for all of us if you could tell us what you’ve learnt. Contrition doesn’t cut it. Let’s hear what you have learned from your mistakes. What exactly it is that you plan to do differently this time around? MYEFO appears to be more of the same disaster. It seems to set us up for further massive cuts in the next Budget, assuming that is you draw the line sometime under your current long-running farce, the Budget and the Senate that wouldn’t budge. Before we offer you our indulgence, Mr Hockey, before we let you try another crank with less choke and a little more accelerator this time, you need to show us that you understand what went wrong, and what it is that you did wrong. It’s not so crazy. One definition of insanity, after all, is expecting different results after repeating the same mistakes. Those mistakes are serious and include the budget debacle, the higher education fiasco, the unfair GP co-payment, in brief the Abbott government’s expensive, overpriced, overhyped, paralysing lack of significant achievement, discounting its dubious asylum seeker solution and its abandonment of a couple of useful taxes on carbon and a mining. The MYEFO exposes the Abbott government’s utter lack of credibility, its failure to act like a government. Despite Mr Hockey’s best efforts today and Matthias Cormann’s breathtaking gift for understatement these are not however remotely endearing or excusable oversights or minor frailties, rather they are signs of terminal illness. MYEFO is no beacon guiding us to recovery, Mr Hockey. Instead we are trapped in Uncle Arthur’s parlour while he tries to find out how to switch on his slide projector. In the dark. Mr Hockey, you and your LNP mob have had long enough to get it right. If you couldn’t do the job, why did you put your hand up for it in the first place? Spare us your ‘reboot’ analogy. An economy is not a computer. Best you think an economy as a real, living thing, an organism which involves real people, ordinary people whose real lives depend on leaders knowing what they are doing. You have a responsibility as Federal Treasurer to ensure their trust is not betrayed. MYEFO could have been a circuit-breaker for you, a genuine opportunity to reflect and take stock. If you are not up to any of that your best option is to withdraw, resign, make way for someone who is. « Abbott’s Peta Credlin: the power behind the Tone will cause his undoing.